Between its exotic Bedouin history and futuristic architecture, the Emirate of Dubai has many attractions for visitors to see, making a guided tour the way to go on a brief visit. Families can begin with Dubai’s roots, exploring the old city and harbor on a traditional dhow cruise, or attending camel races. The tallest building in the world, Burj Khalifa at 2,716.5 feet, is an example of the city’s stunning architecture, especially beautiful at night. The sky-high observatory is truly a thrill for those who aren’t afraid of heights. Given that 80 percent of those who live in Dubai are expats on work assignments, they’re always entertaining visiting friends and family. Tour company Day Out Dubai shares their top five evening activities to make you feel like a local, too. The company offers family city tours in a 4×4 Land Cruiser, making families feel more adventurous than being on a motorcoach. 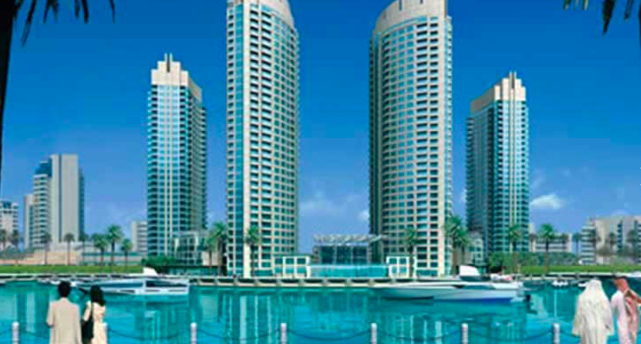 The variety of Dubai city tours includes museums, mosques, the Dubai Mall and some of the world-famous skyscrapers seen in “Mission Impossible: Ghost Protocol,” “Star Wars” and other movies. Day Out Dubai makes it easy by providing a pick-up and drop-off service from your hotel, handy if you are going shopping at the world’s largest shopping extravaganza. The Dubai Mall boasts every store you can imagine from top designers like Alexander McQueen and Versace to bargains like H&M, which are right near shops selling traditional abayas. There are electronics and eyewear, shoe stores and those selling cosmetics, home furnishings and jewelry, even a separate denim area. The mall has an indoor-outdoor area under a retractable roof, big sales in summer and even an aquarium (more on that later)! The city tour is a great orientation because everywhere you go there are people in traditional dress; women especially who wear an abaya (long black robe) and a burqa head covering so that just their eyes uncovered. At City Walk, another chic shopping complex with every variety of designer and global brand, women’s black abayas are displayed in kiosks in the courtyard the way jewelry or mobile phones might be in a U.S. mall. Get outside on one of the truly traditional activities that’s one of the most popular with tourists. Different themes are available for Desert Safaris: Evening, Falconry, Morning, Overnight. The most popular though is Evening Desert Safari, because the temperatures are moderate and the lighting is spectacular on the desert sands. The desert is home to many Bedouins, who historically were nomads and traditionally divided into tribes and shared the job of herding camels and goats. Today, many live in cities but retain their ancestors’ traditional music, poetry, dances and other cultural practices. Locals like to camp in the desert much as Americans would in a state or national park. Another popular activity, especially with locals, is to charter a yacht and take a day or evening cruise along the coast. 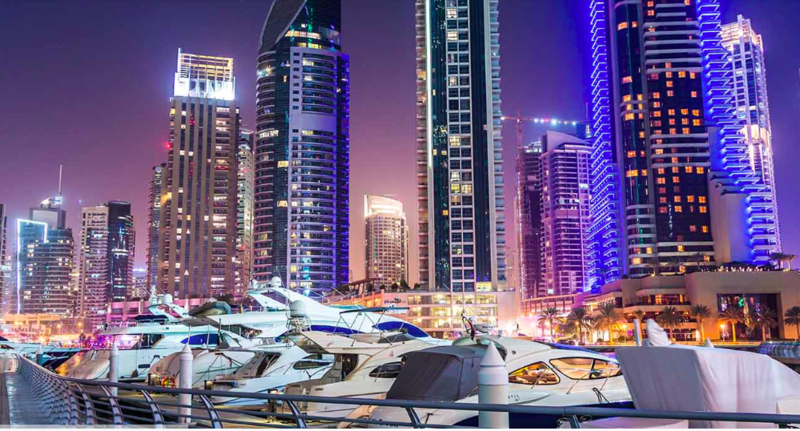 Yacht charters allow visitors to get spectacular shoreline views, enjoy the sunsets and organize parties or events — fun with multigenerational groups and a wy to sample the luxe life the Emirates are known for. There is a wide range of crewed yachts available for parties of four to 200 guests. A dhow is a traditional passenger cruise boat typially seen in the Persian Gulf region. Guests start boarding the largest dhow in Dubai for a dhow dinner and show cruise from 7 p.m. then sail out to sea for a sumptuous buffet dinner. This view of the stunning Dubai skyline, all lit up, is spectacular and such a contrast to being aboard a vessel used for millennia by traders in the Arab Gulf. 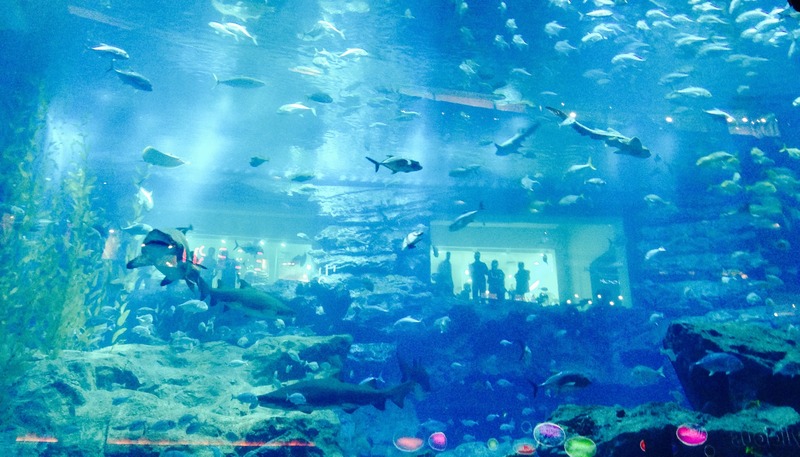 The enormous Dubai Aquarium is a great family destination. Both Dubai Aquarium and Undersea Zoo are located in the Dubai Mall so, even if you are only window shopping, they round out the offerings at the world’s largest shopping venue. It is one of the world’s largest aquariums with more than 33,000 marine animals. Don’t miss the very popular walk-through tunnel; kids will love the effect of being in an aquarium themselves as they are surrounded by sealife. Both venues are a must-see on any family itinerary and use state-of-the-art multimedia to bring the undersea world to life. This post was sponsored by Day Out Dubai and the opinions expressed are the author’s. We are completely in accord with these ‘not to miss 5 experiences in Dubai.’ We experienced them on a family trip last year. The one thing we missed out was the charter yacht. Now we have taken it as a priority for our next trip after reading your post. There is no Doubt, Dubai is most popular destination among tourists from across the world and have gained high popularity in last decade. 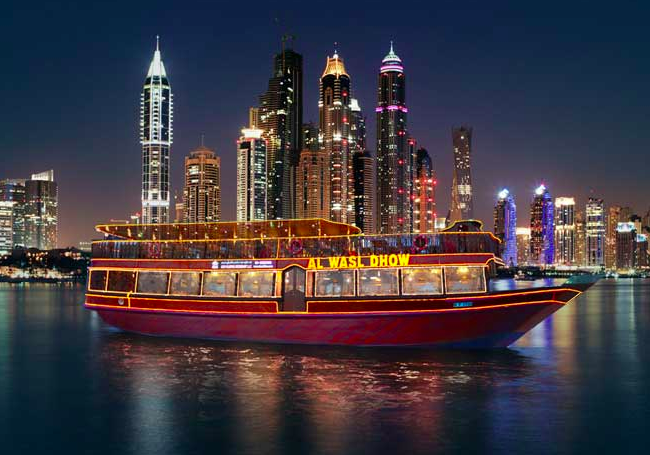 If you are in Dubai and dhow go for dhow cruise, there is some thing missing on your list. There are Dubai dhow cruise, Musandam Dibba dhow cruise and Khasab Musandam dhow cruise. Try some of them and you will love. Being visiting is one of the best experiences of my life. Being there and enjoying every bit of time is wonderful. Personally, my best experience is an underground aquarium and desert safari. One visited Dubai must go for these two activities. Soon I’ll be planning a trip to Dubai. Thanks for the information about what’s worth visiting.